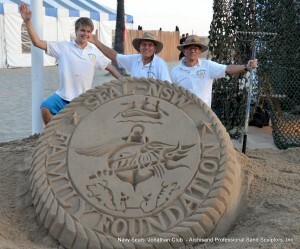 Navy Seals Family Foundation Event at the Jonathan Club – Archisand Professional Sand Sculptors, Inc.
Archisand was asked to help honor the Navy Seals and their families sacrifice due to their service for our freedom. Pacific Event Productions / PEP Creative did an amazing job with the program! The Jonathan Club did amazing work with the venue and food service!